The art and sport of knife throwing has been practiced throughout the history by many people, but only few historical documents are available. Most commonly known is perhaps the fact that soldiers in the American civil war trained knife throwing as a pastime (there is a famous painting of this scene). Quite some African tribes are also known to engage in knife throwing. But in most cases, these "Hunga munga" are too big and either used only to scare an enemy or for ritual functions. As a means of self defense, throwing a knife is not a good option, as you will give your opponent a weapon. And in a difficult situation, you will most likely not be able to throw the knife accurately enough to wound and not enrage your opponent. This is why most martial arts experts are opposed to using this option in a non-desperate situation. Today, knife throwing has of course followers in the circus arts who perform so called impalement acts, where they frame their assistant (mostly female, hence the term target girl) with knives or do other stunts. But the sport has become attractive to a larger audience, who throw knives as a pastime in their backyard, and even gather for conventions and competitions. At first, you will need a throwing knife: it will not break even if abused, is not sharp to protect your hands, and has a point that is made for sticking. Read a quick summary on which good throwing knife to buy. Now grip your knife like you would a hammer. Take the throwing stance: Stand about 3m away from your target, right foot back, about two feetlength behind your left. The feet form an angle of 45°, both heels are about on a line, both knees are bent. Then raise your hand for the throw, a little bit behind your head. Now imagine you want to cut a branch before you with the knife, but you have to stretch to reach it. This is the motion for the knife throw, do it a few times, then go for real: release the knife in the precise moment as it points directly to the target point. It will not stick at once. You first have to correct your distance: the knife turns in its flight, handle and blade pointing forward alternately. Therefore, it will most likely not hit with the point first. Move forward or backward a few centimeters to find the distance where it sticks. 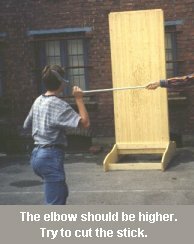 Try not to change anything in your knife throwing motion, the key is to first get a consistent motion, and then find the sticking distance. See a professional throwing a knife (picture sequence). This page is a service of KnifeThrowing.info, and gives just a very short introduction into knife throwing. If you are interested to learn more, read our in-depth articles about the sport and art of knife throwing.